Amazing recipe for the classic Korean Carrot Salad. Raw finely julienned carrots seasoned with ground coriander, chili pepper and sautéed onions in oil all mixed together and topped with fresh cilantro. The crunchy and crispy carrots, lightly fermented will stay fresh if refrigerated for days! Perfect salad recipe to prepare ahead of time for potlucks or parties. Cutting the carrots is the key when making the carrot salad. Hold the carrots at a slight angle to get long thin strands. Season carrots with the ½ teaspoon salt, toss and set aside for the juices and flavors to release from the carrots. Sautee the onions, remove from heat. Stir in the minced garlic and set aside to completely cool. Once the sautéed onions have completely cool, mix in the remaining ingredients. Add the ingredients from the pan over carrots. Mix until salad is combined. Add fresh cilantro or parsley. Refrigerate for at least 2 hours. Enjoy for days. NOTE: In the traditional carrot salad, the seasonings are added directly to the carrots. I find it easier to mix to combine everything with the oil and onion. Though the salad originated in Korea, it’s a popular recipe in the Russian and Ukrainian cuisine. 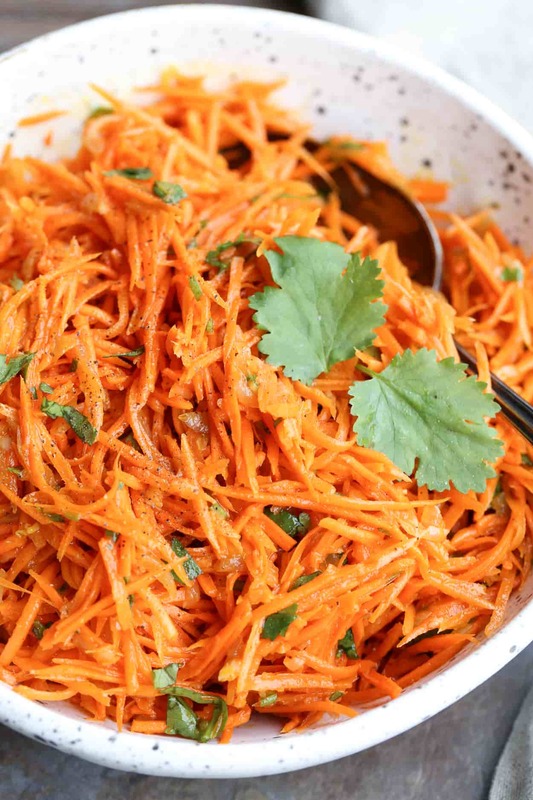 The carrot salad is a staple for parties, wedding, and a regular on the restaurant menus. Everyone has their personal touch they put on the salad and personal spin but the basis of the salad is the same – carrots taken to a whole new level. Crispy Korean Carrot Salad Recipe. Great make ahead recipe. Peal and Julienne the carrots. In a large bowl, combine carrots and ½ tsp salt. Set aside. Finely chop the onion. In a skillet, heat oil. Once hot, sauté the onions until completely cooked and tender. Remove skillet from heat and mix in minced garlic. Once the onions are cooled, add in the pepper, salt, paprika, chili pepper, sugar, vinegar, pepper and coriander. Mix well. Pour everything over the carrots and toss until completely combined. Refrigerate covered at least 2 hours. What do you use to julienne carrots? Best salad! Made it today and will defiantly make it again!! Made extra to enjoy all weekend ? It’s interesting how everyone has their own version of Korean carrot salad recipe. We just happened to finish ours today. When we sauté the onions, we just quarter the onion and let them fry in olive oil on both sides and then pull that onion out since it already released its juices. Then we throw in some raw sesame seeds into the hot oil and later ones you see it’s browning up, put in a little bit of diced up habanero pepper for the spice instead of powdered chili and paprika peppers. Let it fry for 30-45 seconds and take off heat. Cover carrots mixture (with salt sugar coriander and black pepper) with that hot oil containing sesame seeds and habanero or (another pepper ) and mix well then add 1-3tsp vinegar essence at the end. Mix with hands again. Measurements depends on how much lb of carrots you’re using and of course your taste. Also, the salad tastes way juicier and is tastier when made from farm fresh carrots. Valentina, thank you for sharing your version of the carrot salad. It’s a “must” side dish with plov.